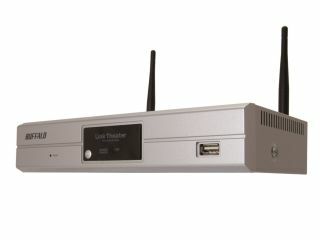 Networking specialist Buffalo has officially announced its new media streamer, the LinkTheater Wireless-A&G Media Player (PC-P4LWAG). As we've previously commented, the new player doesn't stream HD, but a version coming later in the year will. The device features composite, S-video and (apparently much requested) SCART video outputs. The new kit runs Mediabolic's Media Player software and is Intel Viiv-certified. The new player has support for 802.11a/b/g wireless networking and is expected to cost around £150. The device also uses Buffalo's AOSS One-Touch security system and has a USB 2.0 port for connectivity with digital cameras and USB flash drives.